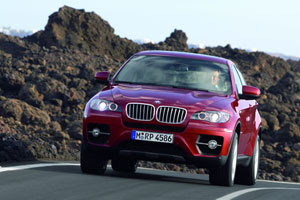 BMW India has launched the world’s first Sports Activity BMW X6 at Infinity Cars, a new dealership facility in Mumbai. The BMW X6 will be available on the Indian roads in two variants – X6 xDrive50i (petrol) and X6 xDrive30d (diesel). Available in the country as Completely Built-up Units (CBU), the BMW X6 xDrive50i will be available for Rs 8290,000 and BMW X6 xDrive30d for Rs 6590,000 respectively. The new V8 power unit with Twin Turbo technology and direct injection in the BMW X6 makes it the most powerful drive unit ever seen in a BMW X Model. The new eight-cylinder is impressive not only through its outstanding thrust and pulling force, but also through its compact dimensions. The new BMW X6 has all the agility and elegance of a coupé plus the impressive versatility of an SAV. The BMW X6 draws its strength from two exclusive automotive worlds to create a new one. The first Sports Activity Coupé. Equipped with BMW Dynamic Performance Control, this is a coupé that knows no limits, especially in terms of driving dynamics.